“I crave that experience… I want the morning sickness, the backaches, the feet swelling. I want to feel the baby move. That is something I’ve wanted for as long as I can remember.” – A 26-year-old woman being screened for a uterus transplant. 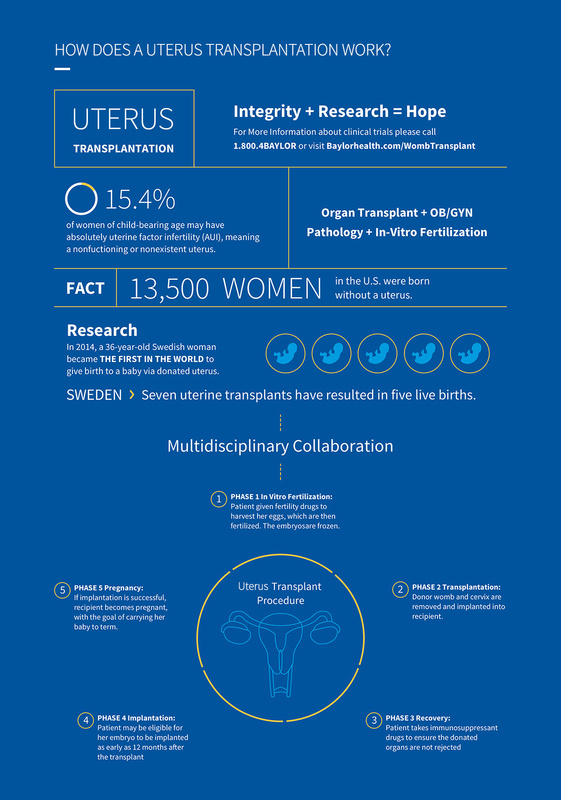 In 2014, Sweden became the pioneer of childbirth via a transplanted uterus when doctors at the University of Gothenburg delivered the first baby that had fully developed inside of a donated uterus. The United States followed suit when, in 2017, a woman in Dallas also carried a child to term inside of a uterus originating from a living donor. Currently, only ten babies have been born using this unconventional method. Possible candidates for uterus transplants are women born with Mayer Rokitansky Kuster Hauser Syndrome (MRKH), a congenital condition that causes abnormal development or absence of the uterus in 1 in 5000 women. Other candidates include patients forced to undergo a hysterectomy (uterus removal) due to cancer or complications during childbirth, as well as transgender females whose biologically male anatomy could be altered to allow them to get pregnant. While a uterus transplant may sound like a convenient solution to these problems, there are many ethical issues to be considered. First would be the health complications associated with this procedure. While the uterus remains inside the mother during pregnancy, she will have to be put on immunosuppressive drugs in order to prevent rejection of the donor organ. Although studies have identified the specific immunosuppressants safe for intake during pregnancy, this medication still has the potential to cause serious complications. For instance, immunosuppressants cause the mother to be more susceptible to infectious diseases. For her baby, even a common cold could be devastating: fevers during early pregnancy are correlated with birth defects such as spina bifida, cleft lip, and limb reduction. One example of this very complication is a failed uterus transplant that occurred in Cleveland in 2016. The transplanted uterus had to be removed only two weeks after insertion due to an infection caused by the candida fungus that compromised the blood supply to the uterus. While long-term side effects for the mother and child are currently impossible to assess, a study by the University of Pennsylvania found that 92% of women with MRKH would be willing to undergo a uterus transplant. It is imperative to make candidates of this procedure aware of the significant risk to themselves and their child. A second ethical issue concerns the increased demand on the black market for yet another human organ that would accompany an increase in the frequency of uterus transplants. Organ trafficking is an international phenomenon affecting developed and developing countries alike. China, Pakistan, Egypt, Columbia, the Philippines, and recently Costa Rica are hotspots for international organ trafficking. This system takes joint advantage of the high demand for hearts, kidneys, and other organs from rich patients in developed nations with the high supply from individuals living in extreme poverty in developing nations who will accept unfairly low compensation (in the range of $5000) for organs such as kidneys. Even worse than such consensual yet exploitative methods is the harvesting of organs from executed prisoners, most of whom comprise religious and ethnic minorities, that has been underway in China for decades. While there has been a crackdown on this practice in recent years, there is no telling when and if it will be completely eradicated. However, in both of these cases, it is the high demand from wealthy patients in developed countries that fuels the exploitation, trafficking, and murder of impoverished and marginalized individuals in developing nations. These global and inhumane impacts of adding a new organ to the trafficking demand list ought to be heavily weighed. The final point to consider is that, despite the great fulfilment it brings to the recipient if successful, a uterus transplant is only a “lifestyle” transplant: it is not a life-saving procedure. As Sharrona Pearl points out in her article, the goal of mothering a biologically-related child can be achieved through a combination of surrogacy and in-vitro fertilization (IVF) using eggs extracted from the mother. Thus, the goal of a uterus-transplant is more than just having a baby: it is experiencing pregnancy. The difference between these two procedures is not in the result, but in the process. As a 26-year-old woman in Ohio being screened for a uterus transplant put it, “I crave that experience… I want the morning sickness, the backaches, the feet swelling. I want to feel the baby move. That is something I’ve wanted for as long as I can remember.” Considering all the relatively low-risk alternatives to a uterus transplant, is this “experience” alone worth unnecessarily endangering the life of mother and child? Tea Binder is a sophomore completing her Bachelor of Arts in Philosophy and Biochemistry at Vassar College, Poughkeepsie, New York. She is also interning for GBI online.